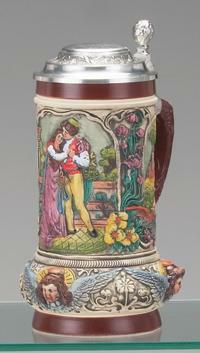 This stein is as romantic as it is beautiful and detailed. 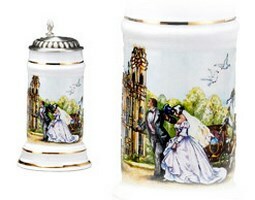 It has a lithophane bottom and offers a touching scene of the bridegroom offering a bouquet of flowers to his intended. 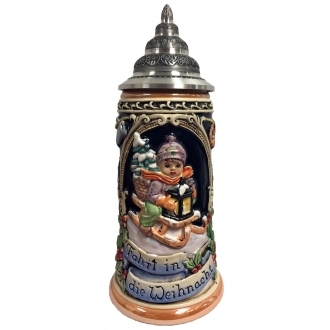 The piece de resistance – and an opportunity to customize the stein to commemorate the event – is an engrave-able lid attached with a threaded hinge pin that can be loosened to allow the lid to be removed – making it easy to engrave.Look no further if you want the most compelling and interesting wedding gift you’re likely to find anywhere – this is sure to be a winner. Order yours today.